This Easter scrapbooking idea is very quick and easy to recreate. It uses two bright and colourful patterned papers, cheerful Easter stickers and some doodling. Materials Used: Doodlebug Baby Girl Stripe paper, Beary Patch Grape Spots cardstock, pink cardstock, cream cardstock, purple alphabet stickers, a purple pen and Suzy’s Zoo Easter Joy stickers. Doodling is a great way to add personality to your page and highlight your photos. In this layout I have used very simple doodling to frame my page. If you are shy of adding doodling to your page, start with something simple like this. You can even use a template as a guide to help you! 1. Use the pink cardstock as your background. 2. Cut three strips of Doodlebug Baby Girl Stripe paper each approximately 6.8cm tall. Make sure that when the strip is placed horizontally, the stripes are vertical. Adhere the first strip horizontally across the centre of your page. Adhere another one approximately 2.5cm above it and the other 2.5cm below it. 3. Using a purple pen, draw a frame around your page. If you are not comfortable doodling free-hand, try using a template or stitching your frame. I have used a scallop shape for my Easter scrapbooking idea, but you can use whatever you want – straight line, dashed line, zig-zag etc. 4. Cut a piece of Beary Patch Grape Spots cardstock measuring approximately 24cm by 18cm. Adhere to your page approximately 5cm from the top and 1.5cm from the right edge. 5. 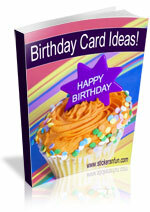 Cut two pieces of cream cardstock large enough to be your photo mats. Glue vertically and side by side in the centre of your Grape Spots cardstock from the previous step. 6. Cut a square of Doodlebug Baby Girl Stripe paper measuring approximately 7cm by 7cm. Place in front of you so the stripes are horizontal. Tear in half along the diagonal from the bottom left corner to the top right corner. so that the stripes are horizontal. Adhere one half to the top left corner of the left photo mat and the other to the bottom right corner of the right photo mat. 7. Adhere your photos in the centre of your photo mats. 8. Use purple alphabet stickers to write your title below your photo mats. 9. 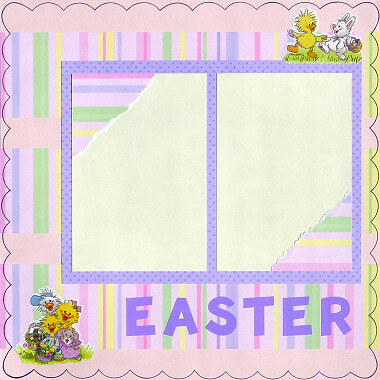 Finally, accent your Easter scrapbooking ideas with Easter stickers in the top right corner and bottom left corner of your page. I’d love to hear what you think about Easter scrapbooking ideas like this and whether or not you give this one a go. Please leave a comment in the comments box below. This entry was posted on Monday, March 8th, 2010 at 10:57 pm	and is filed under Easter, Quick Scrapbooking Ideas. You can follow any responses to this entry through the RSS 2.0 feed. You can leave a response, or trackback from your own site.